What this pictured object is called in English? I was googling for mop and squeegee and got confused since based on the pictures in google images the most mops and squeegees look different. Then what is the accurate name for that? I expect most Americans, when seeing this, would call it a Swiffer, even if it is not actually a Swiffer brand product. It’s similar to how many Americans call any kind of facial tissue a Kleenex. After doing a web search for "dust mop", I agree with Corvus B that the generic term for this product seems to be dust mop. Either plain mop or dust mop, depending on how it's used. A dust mop is used dry to pick up dust. It is not used with water or soap. Your pictured mop looks different than a traditional dust mop, but it would probably work as one. If it's used with water, it is not a dust mop. Some mops of this style have sprayers that squirt soap ahead of the mop. If that's the case, I would just call it a mop. They're essentially the same principle as a traditional mop, just implemented a bit differently to make cleaning them easier. It's not different enough to need a distinct name. If you are trying to find a similar mop on Google or Amazon so you can buy one, then my testing shows that "microfiber mop" or "flat mop" both work well, although I've never heard anyone actually use those terms. If you're asking an employee in a physical store, you can simply call it a mop, because all mop types will be together. It is definitely not a squeegee or sponge mop, because it doesn't have a sponge head that is squeezed with a mechanism on the mop handle. I had only heard such mops referred to as "mops" before, but the Wikipedia page on mops seems to be calling them in general "flat mops" (with other more specific terms based on their features or intended uses). I would immediately understand the term, as it's a mop and it's flat, and a web search for "flat mop" brings up similar results. Dry mop is listed in Merriam-Webster dictionary online as "a long-handled mop for dusting floors". 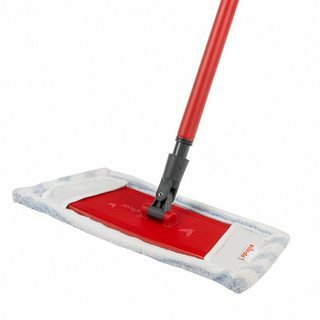 In my place of work we use mops similar to this to dry floors after moping with a regular mop, so as to reduce the risk of people slipping. We call these dry mops. It's a sweeper floor mop, both a sweeping and a mopping tool. There are many different models and shapes. As Todd answered, Swiffer company and many others make such mops. Norwex makes this one we have, they call it a mop. That being said, my wife and I call it the swiffer-- and yes, every time I know I am being wrong and/or lazy. In line with the US "Swiffer" (brand; which I've also seen in Holland), I think in the UK the same market position is held by "e-cloth"; and "e-cloth mop" gives sponsored/shopping results on Google from competing brands, so they use it as a keyword. More generically it would be "microfibre mop" as that's the type of cloth without brand name. What to call light food served at cocktail parties, that can be eaten on the thumb?